The state flag with the words HENNEPIN COUNTY written below the seal in white. A very small image of the flag was published [temporarily] on wwwa.co.hennepin.mn.us/portal/site/HCInternet [direct link: wwwa.co.hennepin.mn.us/files/HCInternet/Image%20Library/Public%20Affairs/Raw%20Images/IMG_4107.jpg]. 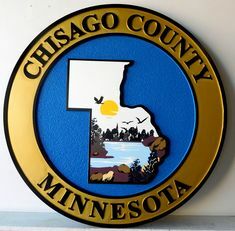 I've been all over Hennepin County and never have seen this flag. I don't think it is used much, probably just at one site. The City of Minneapolis, which has a fair flag and nearly a million people, is located in Hennepin County.